Our lives can’t always be a series of engaging activities, but we can turn even mundane maintenance activities into interesting challenges. For instance, I used to intensely dislike grocery shopping even though I do like cooking. After reading Finding Flow by Mihaly Csikszentmihalyi, I decided I could challenge myself to get the shopping done as quickly and efficiently as possible. I have worked out the best evening to do it (Wednesdays). I note the time when I arrive in the parking lot. I have a shopping list organized the same way the store is organized. And I have a failsafe way of remembering to take my cloth bags into the store. Before I get out of my car, I spring the trunk lock because I am going to put my handbag in the trunk (after removing my change purse and shopping list). And there with the trunk open, I pick up those cloth bags. Once inside the store, I follow a route that will take me through as quickly as possible. While I’m waiting at the checkout, I entertain myself by looking at what other people have in their carts and feeling superior that mine contains more healthy items. I check my time and give myself a cheer when I have loaded everything into the trunk of the car and I am ready to leave. I’ve turned grocery shopping from a dreary duty into an interesting challenge. While I am doing a routine task, my brain is engaged in working toward a goal of finishing the task as efficiently as possible and I am happier. This may not be everyone’s approach to grocery shopping but, because I found it so dreary, the techniques I came up with made it an opportunity to find flow and keep my brain challenged. "10 Ways to Keep Your Brain Healthy"
The information included in this chapter of Get More Power from Your Brain is in order of effectiveness to get and keep your brain as healthy and productive as possible. The most important thing to understand about your brain is that it can continue to grow new neurons and dendrites throughout your life. 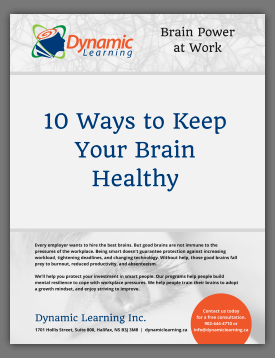 When you sign up below for Dynamic Learning's monthly newsletter, you'll get this handy reference guide as a bonus. © 2019 Dynamic Learning Inc. Website by Daley Progress Inc.